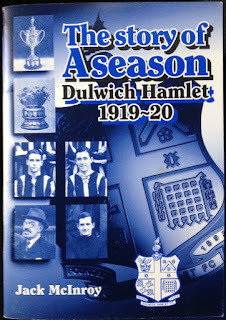 Some extremely rare matchday programmes from Dulwich Hamlet’s greatest ever season have just surfaced. 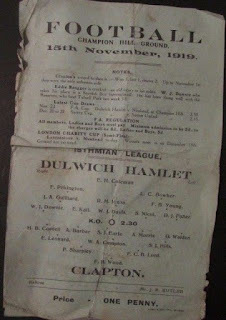 One or two of the nine home programmes are a bit battered but they reveal little tidbits of club history not always found in newspaper reports. 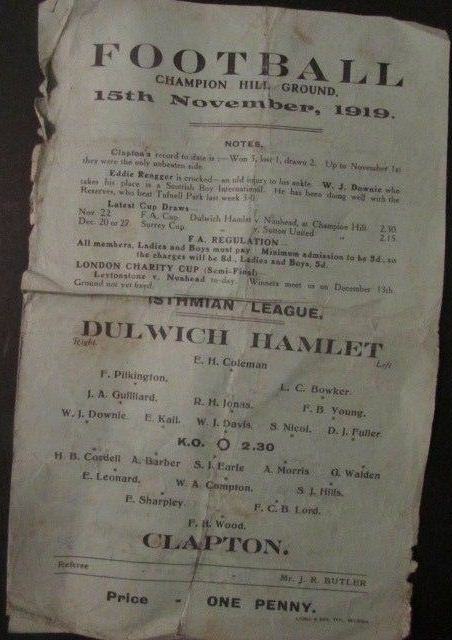 The earliest dates from 15 November 1919, an Isthmian League match with Clapton which Dulwich won 2-1. 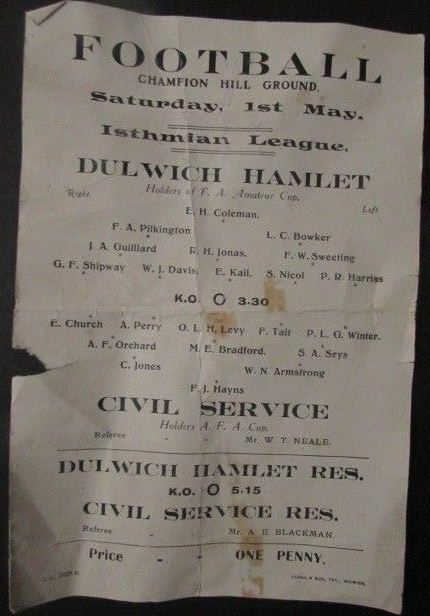 The last is for the final match against the Civil Service, one which Dulwich Hamlet had to win to secure the League and Cup double. It was the legendary Edgar Kail that scored that all important goal. 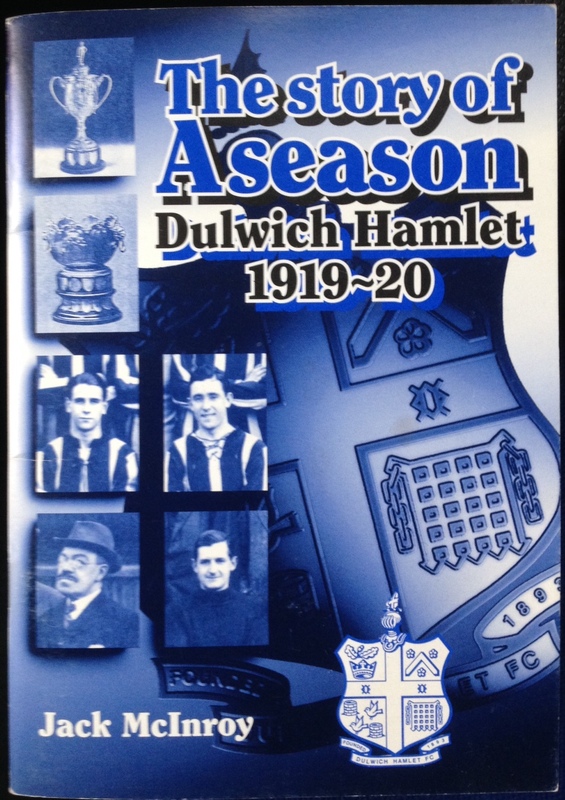 A more detailed look into the Hamlet's greatest ever season can be found in my little book The Story of a Season: Dulwich Hamlet 1919-20. This book from 1996 is long out of print. After Football League Club Aldershot went bust in 1991, few thought that the Hamlet would ever play a team called Aldershot again. But with their reformation in 1992 and their subsequent rise up the isthmian League, we played them regularly in Premier Division fixtures. 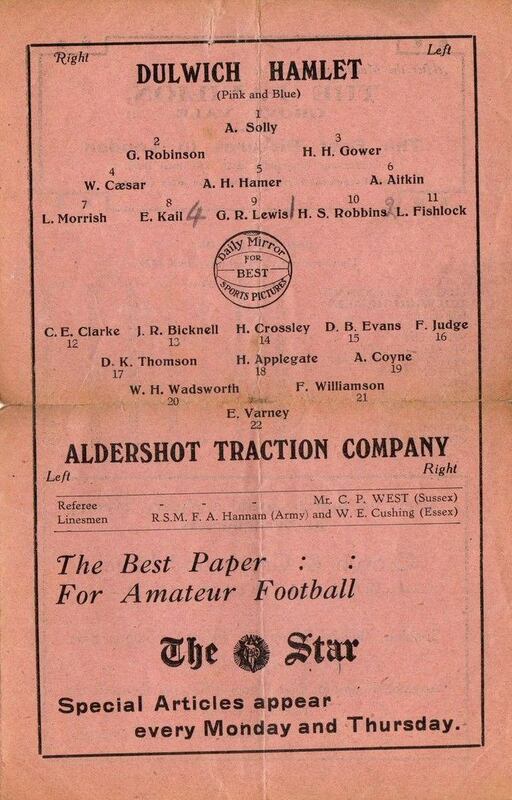 Apart from when we met Aldershot in the FA Amateur Cup in 1937, we had previously hosted a team named from the military town twice before. 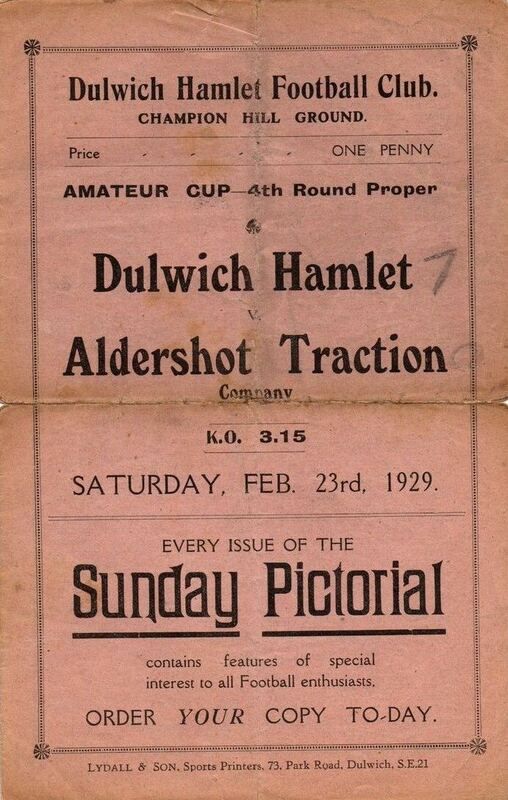 But it was not Aldershot Town. 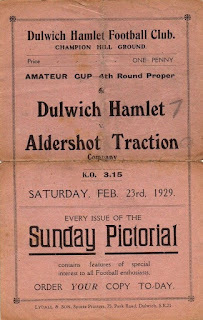 It was ALDERSHOT TRACTION COMPANY, and they visited the ‘old, old’ Champion Hill, prior to the ‘old’ Champion Hill being opened in 1931, for two FA Amateur Cup ties in the nineteen twenties. Here’s how the games went. 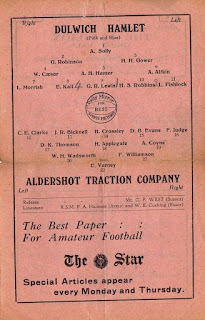 Aldershot Traction Company made their virgin visit to Champion Hill on 17 January 1925 for an FA Amateur Cup second round tie, having beaten Wycombe Wanderers in Hampshire the round before. 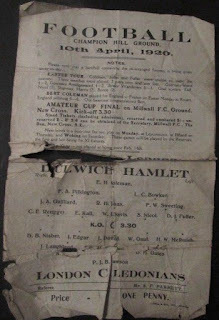 The Hamlet won by three goals to one on a fine day in front of over five and a half thousand spectators. The Hamlet kicked off and had the ball in the back of the net after only two minutes, but the goal was ruled out for offside. Aldershot fought back after this piece of luck and pushed forward down the right, the Hamlet conceding a corner, which the company failed to do anything with. 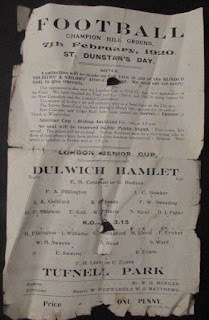 Dulwich then took control. Williamson cleared for a corner with the visitors’ keeper well beaten. The Hamlet continued to dominate. And the inevitable first goal came after twenty minutes when Bill Davis made a good pass to Edgar Kail, who knocked the ball onto Jones, who shot and scored. The Aldershot goal was now under siege, and had many narrow escapes. But for the fine performance of Pearce between the visitors’ sticks it could have been a cricket score. Aldershot then conceded a penalty for handball, but when Caesar took the spot kick his rasping shot stuck the woodwork and traveled out across the goalmouth and out of play, much to the dismay of the Hamlet supporters. Vanner, for the Traction Co., had a rare shot but was denied by Williams. 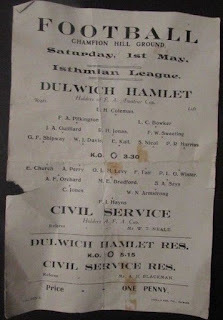 On changing ends for the second half Dulwich made a sensational start, but Sid Nicol fluffed his shot when he blasted a sitter over the bar. Shortly after, Aldershot conceded a corner and from Gatland's kick, Davis headed towards goal but Pearce just tipped the ball over. Then a characteristic run and pass from Kaii resulted in Davis adding to the Hamlet’s tally with a second goal twenty minutes into the second period. Aldershot then fought back and for a time held their own, until Dulwich hit back with another attack, Jones netting from a pass by Nicol. The Traction did not give up and a couple of chances fell to Vanner and Hunt. 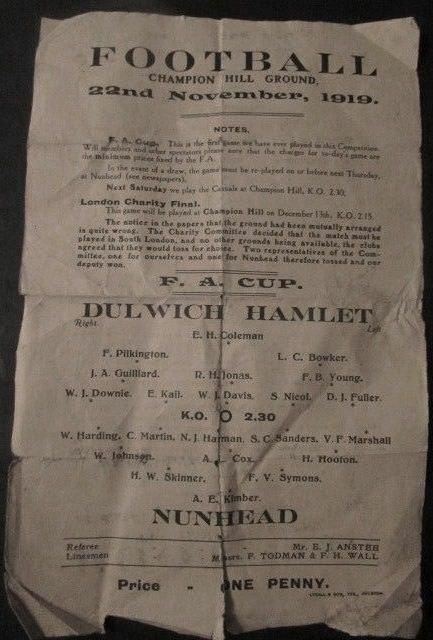 The referee then blew, for an apparent foul by Kail on Humphries, who from the resultant kick knocked the ball out on the left to Sturt who netted a consolation for the visitors right on time. 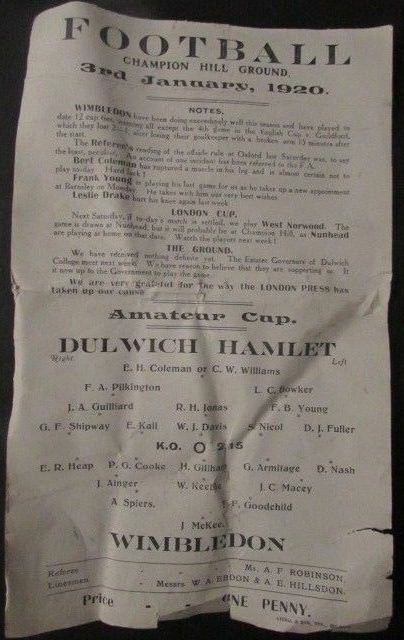 Traction were to be complimented on their plucky display, they fought every inch of ground with splendid tenacity right up to the final whistle, and fully deserved the accolades paid to them in the dressing rooms afterwards by a Dulwich official. 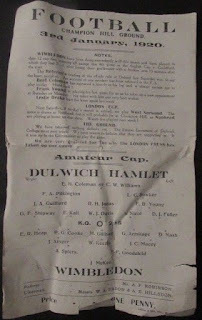 The star players for Dulwich were Jonas, Jones, Kail, Caesar and Goodliffe; whilst for Aldershot Traction Company – Pearce, Williamson, Harris, Humphries, H. Applegate and Vanner impressed. 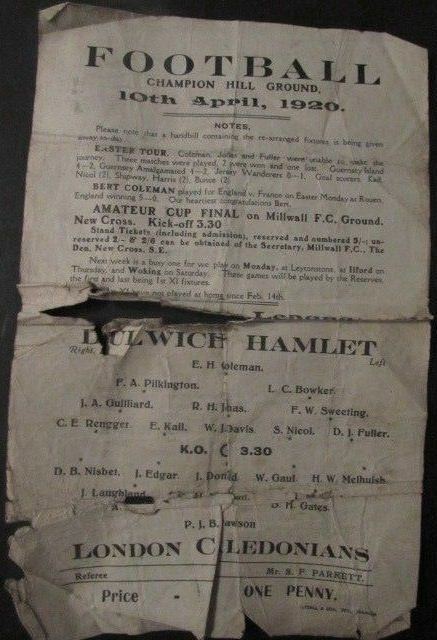 For the record, in the first round the Hamlet drew one apiece at home to Enfield, before winning the replay four one. 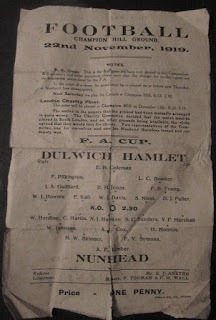 In the third round a 1-1 draw was fought out with Nunhead at their Browns Ground, with the Hamlet winning the replay back at Champion Hill by the odd goal in three. 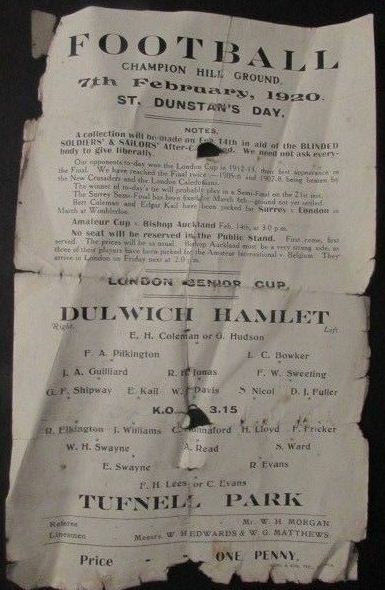 The quarter finals saw Dulwich lose by the only goal of the game to Southall, who went on to reach the final, losing 2-1 to Clapton at The Den. 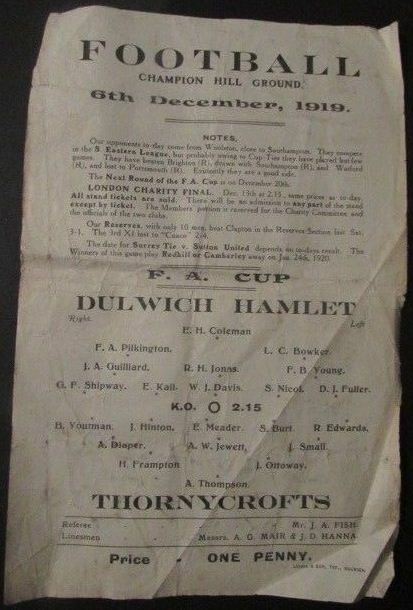 Three seasons later the two clubs paths met again, with the stakes a bit higher, as this was the FA Amateur Cup quarter finals. Again the match was at Champion Hill, and this time the match was even more one sided. In the first round the Hamlet had won 7-1 at Eastbourne, whilst the Traction had won 2-1 at home to Portland United. A local derby in the next round saw Dulwich beat Bromley four goals to two at Champion Hill, as Aldershot overcame Barking Town 4-2 at home. 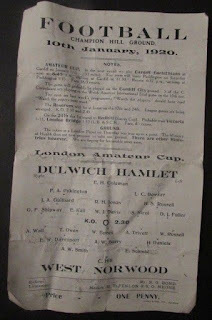 The last sixteen saw Dulwich hit seven again, this time at home in a 7-1 crushing of Wycombe Wanderers, with Traction winning 5-3 away to Whitehall Printeries. 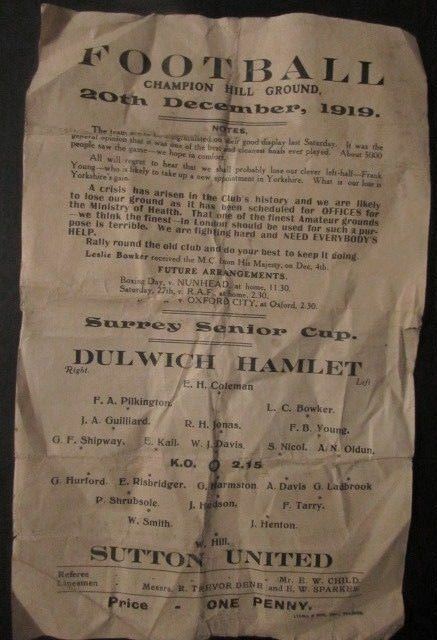 So the scene was set for this fourth round clash on 20 February 1929. 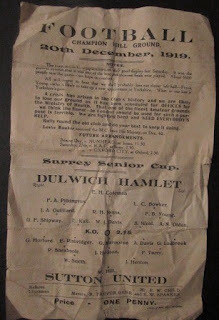 In a sense, history repeated itself, when the Hamlet once again hit seven in the Amateur Cup, this time for no response. The Aldershot team came with a great reputation, and for a small part of the opening half maintained it. They held the Hamlet and were unlucky nor to open the scoring. 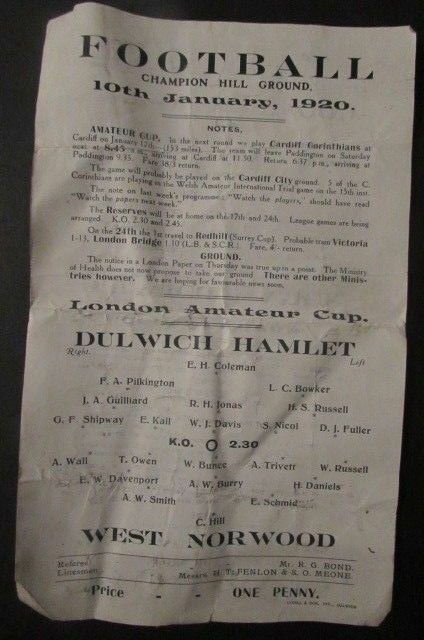 Gradually, but surely, the Dulwich defence wore them down, allowing the home forwards to take control of the match. And then the contest was all but over. Edgar Kail gave another brilliant display of scheming forward tactics, and besides scoring twice in each half, opened out the game for others to take benefit. Robbins began the scoring after a back-pass from Lewis, and after Kail added his couple Lewis turned in a long cross from Morrish to score. directly after the break Kail claimed his hat trick, and ten minutes later his fourth and the Hamlet’s sixth goal. Robbins completed the tally from the penalty spot after Kail had been fouled. The Aldershot team tried hard, but ineffectually, they were completely beaten by a rampant Hamlet side. A below par Hamlet lost by four goals to one to Ilford at Stamford Bridge. 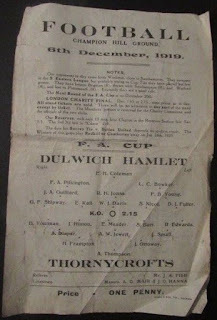 Ilford went on to win the Amateur Cup beating Leyton in the final at Highbury. Original article from HH6 Winter 2000. Copyright © Mishi Morath.